Recently I had two close brushes with death. Both really frightened me. I began to feel like my life was hanging in precarious balance, somewhere between ‘barely here’ and ‘gone forever.’ I was assailed by feelings of generalized anxiety. Well, I thought, how about a change of scene? I’ll take a day trip to a mining town only an hour or so away. So I hopped in the car and headed out towards the big mountains. Turned out there was a lot of snow still up there. The mountains were 13,000 feet high, and this was the standard mountain, not the outstanding one. Most of the side roads were impassable because of the snow. I was wearing a summer dress and sandals. All I had for warmth was a sweatshirt. I was feeling unprepared and … well … anxious. Quite anxious. And hungry too. Finally I got to the mining town. Put on my sweatshirt and got out of the car, looking for a sandwich somewhere. It was a little early for the tourist season. Almost none of the shops were open. The wind picked up, and snowflakes started to flurry down. I went back to the car for a wool blanket, and wore that, Indian-style, as I hunted for a restaurant. Finally found a place that was open. A charming, quaint place, with good food. As to the sign that hung outside the door, though, I could have wished for better … it was a painting of a skeleton riding a motorcycle. I had to laugh! This ‘fear of death’ topic had been popping up in my life so often in recent days that it just wasn’t that scary anymore. 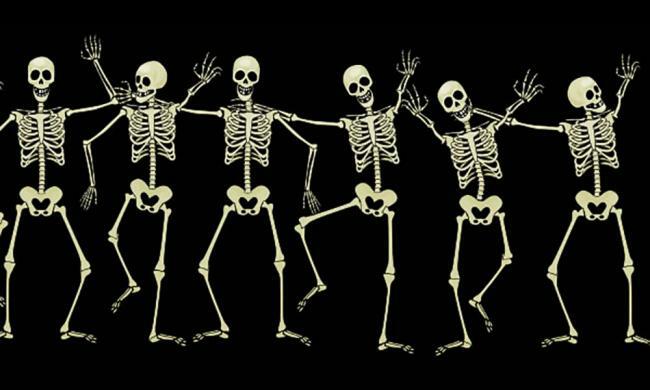 Image: Skeletons dancing: https://www.visitstaugustine.com/sites/default/files/styles/cover/public/events/cover/skeletons-ripleys-10×6-4web.jpg ..
As you may know, there’s a lot of basal chakra (root chakra) clearing going on now. This is the chakra situated at the base of the spine. Some say it’s our most ‘primitive’ chakra. In order for us to ground properly – feel centered, feel well balanced, feel the Earth beneath our feet -– the basal chakra must be clear. When it’s clear, our life force becomes strong enough to allay our fears and make us aware of our talents. So, in order for us to come into our own as fully developed human beings on Earth, our basal chakra must be cleared. And the incoming light of New Earth is providing us with the experiences we need to clear the basal chakra. Tailor-made experiences for each of us. Maybe you’ve lost your house or your job. Maybe you’ve had a close brush with death, or a severe illness recently. Maybe you’ve been reading the news, and you’re in a state of alarm over the state of the world. Maybe you’ve been watching the violence on TV or at the movies, and it’s beginning to look like violence is everywhere. Why is this happening? Believe me, it’s not so that we can have panic attack after panic attack. It’s happening so that we can feel these issues of basal chakra insecurity, cleanse the chakra, and step into self-mastery. This entry was posted in 1st chakra - root chakra - basal chakra, Lower triangle, Prophecy - oracles - seers - mystery schools - cloud readings, Rambles through the brambles, Yoga and tagged basal chakra, chakra clearing, first chakra, Lower triangle, omens, prophecies, Rambles through the brambles, root chakra, Yoga on 4 May 2013 by Alice B. Clagett.